New York State have no protections whatsoever. Nick Reisman: Tenant groups & others call on Gov. City & State: Which NYC Districts Have the Most Rent-Regulated or Public Housing? New York State's rent laws are expiring in June 2019. State Senator Liz Krueger is hosting an event to help New Yorkers learn about their rights and join the fight to strengthen the laws. The event will start with a discussion on rent law renewal with Mike McKee of TenantsPAC and Delsenia Glover of Tenants & Neighbors, followed by four workshops facilitated by tenant lawyers: Basics of Rent Regulation, If Your Landlord Wants You Out, How To Get Repairs & Improve Building Conditions, and Housing Resources for Older Adults & People with Disabilities. The event will take place on Wednesday, December 5th, from 6pm to 8:30pm at CUNY Graduate Center, Proshansky Auditorium, 365 Fifth Avenue between 34th and 35th Streets. The City Council speaker is introducing a raft of bills on Wednesday aimed at stopping landlords from harassing rent-regulated tenants to force them out of their apartments. The speaker, Corey Johnson, said the package of 18 bills is intended to close loopholes and address abusive practices identified in The New York Times’s recent series, “Unsheltered,” which showed how some large landlords exploit New York’s fragmented regulatory system to push apartments out of regulation. New York Times: Democrats finally control power in Albany. What will they do with it? Dems win control of NYS Senate!! The Democrats have won control over NY State's Senate. That gives Democrats control over the Assembly, the Senate, and the Governor's mansion. Now it's time to see whether they will enact the bills they have safely endorsed over the years (knowing they wouldn't be passed). Curbed NY - Tenants in Janel Towers, a former Mitchell-Lama, are pleased. Thanks to the incredible work of tenants across this city, the powerful Rent Stabilization Association (RSA) is feeling the heat! And what does the RSA do when they want to shut people down? They file lawsuits to tie up our time and our money. And that is just what they are doing to us. Met Council on Housing, along with Michael McKee, Tenants PAC, and the Real Rent Reform campaign, are being sued by the RSA for millions. This means the RSA knows we are a powerful movement and that they are worried about what we can win in 2019 when the rent laws expire - just cause evictions, preferential rent reform, an end to MCIs, rent control reform. 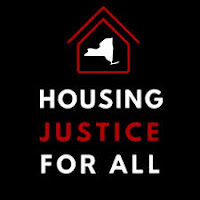 They are trying to refocus our energy on fighting this lawsuit instead of fighting for just rent laws. Vote in the primaries on Thursday, Sept 13th! Find your polling location here. You stand up to your landlord every day. Together, we can stand up to the RSA.